Why Make Us Your Go-To Tire Center? Customer safety is top priority here at Fletcher Jones imports. So, when you come to us for tire service, you’ll find an extensive inventory of top-brand tires and a team of certified technicians. We know that a number of factors can affect the longevity of your tires, such as tire pressure and road conditions. Our team will take your individual driving habits, as well as your vehicle’s performance profile, into account, and help you choose tires that’ll serve you well. Regardless of tread wear, Mercedes-Benz suggests that you replace your tires and spare every six years. Tire replacement can be costly, and we want to be sure drivers in Las Vegas, Summerlin, and other local areas have access to the best possible deals. 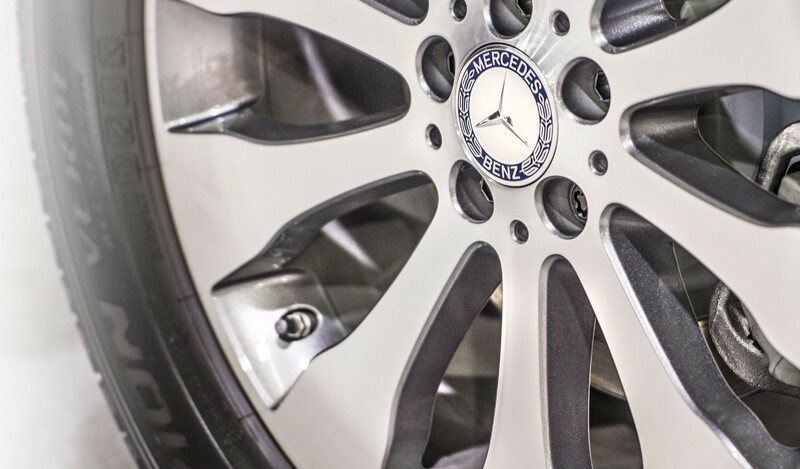 That’s why we offer a price-match guarantee on all other Mercedes-Benz dealers’ published tire prices. If you find an online or print publication with lower tire prices than ours, don’t hesitate to show us! Tire Inspection: Aside from routinely checking tire pressure, bringing your vehicle in for tire inspections is the most effective way to keep its tires intact. While you’re here, we’ll perform any other services you require, be it factory-scheduled maintenance or a parts installation. No need to shop around Las Vegas for an auto center! Wheel Alignment: The most common symptom of misaligned wheels is “pulling” from left to right while the car’s in motion. Our team can complete a four-wheel computerized front/rear suspension alignment to prevent uneven tread wear. *Tire Rotation: Preventing uneven tread wear is as simple as bringing your vehicle to us for regular tire rotations. Tire Balancing: Tires don’t last forever, but you can get the most out of your investment by scheduling four-wheel computerized tire balancing. This service will prevent rapid tread wear and vehicle vibration on the road. During the first 12 months, Road Hazard Tire Protection covers tire replacements at 100% of the replacement cost of the original tire (up to $550 per tire if purchased after March 14, 2014). For the second 12-month increment, tire replacements are covered at 50% of the replacement cost (not to exceed the original purchase price). Any charges beyond the 100% or 50% adjustments, such as balancing, sales tax, and disposal fees, are the responsibility of the customer. Under this plan, tires that are damaged due to road hazards are replaced—not repaired—giving Paradise drivers greater peace of mind. This replacement-only policy applies to tires sold after March 14, 2014. Your tires’ quality, or lack of quality, affects many other aspects of your vehicle, from braking to acceleration. The reliability of the tire brand isn’t the only factor that needs to be considered before you buy; we’ll make sure you’re getting a set of tires that supports your car’s power output, brake system, and suspension. When you shop with Fletcher Jones Imports, we’ll make sure your vehicle is outfitted with the tires the manufacturer intended. While it’s not unusual for auto shops around Las Vegas to carry top-brand tires—like Dunlop, Goodyear, and Pirelli—that doesn’t mean they’ll know which brand, tread, or size suits your vehicle. It’s commonly misunderstood that tires are more expensive at a dealership. However, when you compare our tire prices to those of independent shops and other Mercedes-Benz dealers, you’ll find us to be more than fair. Should you find a lower published tire price from one of our competitors, we’ll match it!